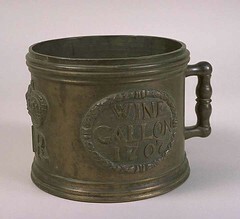 Imperial Wine Gallon, 1707, a photo by east_lothian_museums on Flickr. When Better Together and other unionists are asked to present the positive case for the Union, they tend to struggle. Most of the time, they simply mention some past achievement, such as winning the two World Wars, but if pressed, they either come up with something that isn’t of great benefit to most Scots (e.g., the UK has more embassies than an independent Scotland is likely to have, for instance in South Sudan), or they make a thinly veiled threat and say that it’s positive because it won’t happen if we vote No (e.g., there are currently no border posts on the English-Scottish border — forgetting that manned border posts are rapidly disappearing all over Europe). Sharing the colonies — given that Scotland had practically none, this was of great benefit to Scotland. Getting protected by the Royal Navy instead of being hassled by it. Access to sell products in England — at this time there were lots of trade barriers between countries. A guarantee that Scotland wouldn’t get invaded by the English — again, a real possibility at the time. I’m not saying that creating a political union with England in 1707 was necessarily the right choice, but you could at least put up a positive case for it. However, the modern international set-up (including organisations like the EU, NATO, WTO and the CoE) means that these arguments have lost their potency. Of course nobody knows the future, but there aren’t many signs that all the current international organisations will be abolished any time soon, and unless that happens, it’s unlikely there will be a positive case for small countries to attach themselves to their largest neighbour.